Vincenzo Nibali and his Astana team have apologised after the Italian was disqualified from the Vuelta a Espana for being towed by a support car. 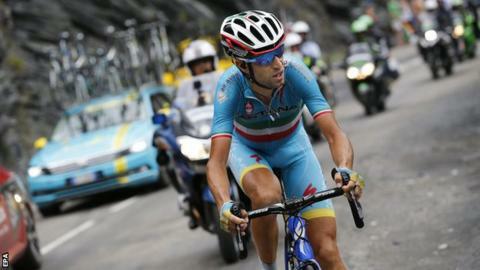 Nibali was pictured being helped up the road for five seconds as he tried to regain ground after a crash on Sunday. The 2010 Vuelta winner, one of several to fall, had lost 88 seconds with around 30km of stage two remaining. "I want to publicly apologise for what happened. Especially for the people who are angry or ashamed of me," he said. Images showed the Astana team car pulling alongside Nibali, Tour de France winner in 2014, before both he and the car accelerated rapidly. Judges decided Nibali was either towed by the car as he held it or as he grabbed on to a water bottle extended from the window - which is not an uncommon sight in cycling. "There are lots of episodes like this and especially so after a crash," Nibali, 30, added in a statement on his Facebook page. "I thought I'd get a fine and time penalty that would take me out of the overall classification. After all, I won't be the first or last to do this kind of thing." Colombia's Esteban Chaves leads the general classification at the Vuelta by five seconds after two stages of a race that ends on 13 September in Madrid. Britain's Tour de France champion Chris Froome is chasing a Vuelta-Tour double that has been done just twice before.